I'm sure you've noticed that it takes a lot of work to keep a household running. First, there's the necessity of having a paying job to provide an income. Then there's the meal preparation, house cleaning, yard work, laundry, bill paying and grocery shopping. In our house we have the added task of stacking our firewood each year when it is delivered, then the job of bringing it inside throughout the winter to be used in the furnace. The idea of any one person doing all of that work is crazy. It simply wouldn't be possible. Even in times where men did nothing in the house, they generally were the ones to provide the income, so there was a sharing of the work. All of us who are a part of the household should be helping with the work of running the household. Obviously, not everyone will do the same work (Nathan, who is 9, doesn't have a job to help pay the bills, for example), but everyone should be doing something. One of the jobs our boys help with is the stacking and bringing in of the firewood. When people comment about how good it is that the boys help with the wood, I laugh and say that they like to be warm just as much as we do, so it's only right they help. There's a lot of work involved in building up God's church too, and it's only right that all of us who are a part of it should be doing our portion of that work. In fact, Paul wrote that everyone doing their share is actually crucial to the maturity of the church. Note here that I am not writing about the particular church that we attend on Sundays, either the building or the congregation that meets there. I'm referring to the whole family of God, all of those around the world who believe in Jesus as Savior. Ephesians 4:11-13 says: "So Christ himself gave the apostles, the prophets, the evangelists, the pastors and teachers, to equip his people for works of service, so that the body of Christ may be built up until we all reach unity in the faith and in the knowledge of the Son of God and become mature, attaining to the whole measure of the fullness of Christ." There is so much in these three verses! First of all, notice that the leaders of the church (the apostles, prophets, evangelists, pastors and teachers) are given to the church to equip everyone else for works of service. The clergy are not the only ones who are to be serving the church and the community. We're all supposed to be doing it. If we are all doing our part, whatever that may be, then just look at all that will come from our combined efforts: the body of Christ, the church, will be built up until we all reach unity in the faith and in the knowledge of the Son of God and we will become mature, attaining to the whole measure of the fullness of Christ. Building up the church can be taken here to mean both increasing the number of those who are members of the church and the spiritual growth of all believers. Isn't it interesting that this building up of the church will continue until we all reach unity in the faith? We will also have unity in the knowledge of the Son of God, which I think goes hand in hand with unity in the faith, since it means that we will all agree on everything pertaining to the Son of God. On top of that, or maybe because of it, we will be mature in the faith, no longer weak or immature. Now attaining to the whole measure of the fullness of Christ is a little hard to understand, but basically it means that we will become Christ-like. We will exhibit the character of Jesus in our everyday lives because of our spiritual growth and maturity. Don't you want all of that? I know I do. Which means we must be seeking ways to serve others according to the gifts God has given us. What I do and what you do may be different, but that doesn't change the fact that we should be using the gifts God has given us to reach people for Him and to encourage spiritual growth. 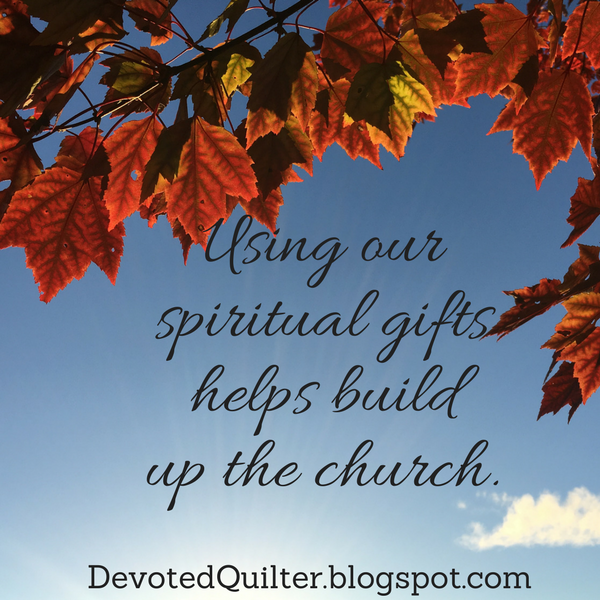 It's up to all of us to pitch in and use our spiritual gifts to build up the church.